Last December I got a PM from a fellow forum member that this website, listed in my sig, was marked as an Attack Site by Norton. Oh, joy. I get little enough readership as it is. He gave me a list of malware my site was supposed to have, complete URL’s. Needless to say they were all bogus, 404’s all. So, I poke around and find the product is Norton Safe Web, and I need to: create an account, verify my site, and request a re-evaluation. OK, great. That’s where the trouble began. Norton wants Meta tags in the <head> section before the the first <body> section. First of all, all help for wordpress.org users is useless. There is no Editor button below Appearance on wordpress.com. There is no way to edit header.php on WordPress.com. There is no way to upload the verification file to the root folder of your site. You can Add Media, but it goes elsewhere. What you can do is create a Text widget and load the Norton Meta tag there. Only, that doesn’t work for Norton site verification, maybe because it’s nowhere near the <head> section of your home page. After 3 months of retrying (yes I’m persistent, no I didn’t do it every day), I can confidently say, this doesn’t work. I’m not the only one. The Norton Community site is littered with conversations like this one, where manual intervention is required on their side. So, nothing to do but go begging at Norton Community. Time to sign up. Only I can’t. First I click “sign up”. Then it tells me to Accept Terms and Conditions of use, and fill out the form. But there is no form (tried it with all web blockers and script blockers turned off). The Confirm button takes me straight to an error page. So, no community help for me. What now? I click around and find Chat support. Great! Off I go. I’m soon connected to a solicitous helper. I explain my problem. I’m a site owner. It has a false positive for Malware on Norton Safe Web. I am trying to get verified on Safe Web. I have the Meta Tags on my front page. Verification always fails. He takes a few minutes to research the problem. Then comes the next question: am I using the device to chat that has the problem? Oh, wow. He’s stuck in his script, he got nothing of the above. I start from another angle. I am running ZERO Norton software (thank God). I have a Blog. Norton has it falsely listed as Malware. I need to Verify my site to ID myself as site owner. Verification always fails. He goes away for another several minutes. I get an email laying out how to do everything I’ve already done, and he happily tells me to do what’s in the email. Wow. I’ve told him 3 times how I had just done all of that, everything that could be done, anyway. He says the data I’ve entered is invalid. I give him my URL and ask him to tell me what is invalid, it is straight cut and paste. He says he sees the meta tags on my site… I ask for escalation. He takes my number, and says someone will get back to me in 24-48 hours. I’m still waiting. So, I’m still stuck in Norton Safe Web hell. I’ll update if anything ever happens. UPDATE: Four days later, or two days after the 24-48 hours, and I just got a call from a very polite man with Norton. He had me put together the Meta tag, a screenshot of the error message, and the Ticket ID I can’t get, in an e-mail with my Case Number (which I do have) in the Subject. We’ll see if I get one of those manual back-end verifications discussed on the Community site that I can’t log into. Update April 4, 2016. 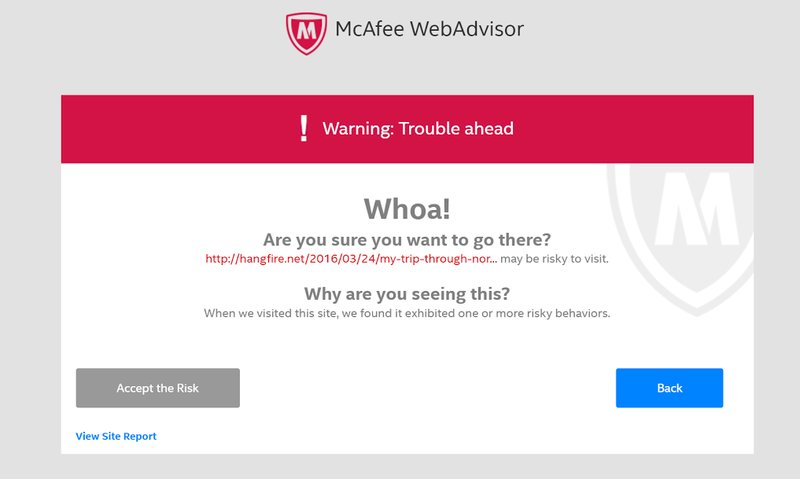 I entered a Mcafee ticket, my website was re-evaluated, and as soon as everyone’s anti-malware updates, this blog will be viewable again. It was all easy and painless. Update April 30, 2016. My site is still blacklisted. Had a long text Chat with Norton support, after arguing a length about not having a Ticket number (I have a case number, but the agent didn’t know what to do with a Verification problem without a Ticket number, but I never got that far…) finally convinced them to escalate again, Case Number 27059849. Update Well, as of Monday May 2, my website’s name has been cleared, and I suddenly am verified. In the end it was social media that saved the day, my Facebook compliants of the May 1st (OK, I spammed their main page comments) resulted in real action. I have to ask, though, this is a procedure for wordpress.com users? Really?